Another STAR product of Lee JiHam, LJH Cellabel M.C. Vital CC Cream! All-in-one product, just 1 step you can achieve an awesome results! It’s a skincare + cosmetics product. Anti-Blemish, Super Whitening & Anti-wrinkle with SPF30 PA++! The most amazing things about LJH Cellabel M.C. Vital CC Cream is, it’s able to blend in any skin colour. You can see from the pictures below, as you slowly blend the CC Cream, it will changes the tone to suit your skin. Suitable for all skin type & tone! Closed up picture of my face after applied Lee JiHam Vital CC Cream. * All the pictures of my face were unedited and no filter. Reviews: LJH Vital CC Cream even out the skin tone effectively, it doesn’t makes me look extra fair. It gave a very natural look, coverage is very good as well, no concealer is use. LJH Vital CC Cream is non-greasy and doesn’t gives any sticky feeling. I have a combination skin, at the end of the day my face doesn’t feel oily at all! 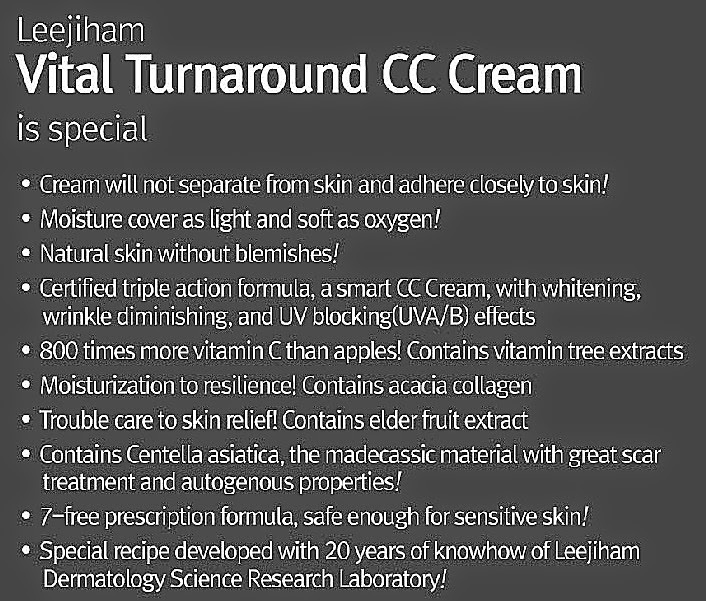 Lee JiHam Vital CC Cream is selling at SGD 36.00 in HKCplaza.com. Don’t forget to utilize the 10% discount! HKCplaza.com is giving my readers 10% discount store wide! to enjoy the 10% discount, you can purchase any products in HKCplaza and on top of any current discounts or promotions! On top of the 10% discount, HKCplaza would like to invite my readers to redeem some complimentary gifts. It will direct you to the page where you can redeem some Starter Kits for FREE.